Blythswood , Glaick near Balmacara looks south over Lochalsh to Skye. The West Coast of Scotland has some of the most beautiful and romantic island and mountain terrain in the world. The Isle of Skye, Plockton, the Five Sisters of Kintail, Eilean Donan Castle and Lochalsh are world famous and their beauty and tranquility have attracted artists and writers over the centuries. Turner's Loch Scavaig, and Gavin Maxwell's "Ring of Bright Water" are well known and the otters of "Camus Fearna" (or Sandaig) still play on the shore below our house. Even Johnson seems to have been favourably impressed by this part of his trip. 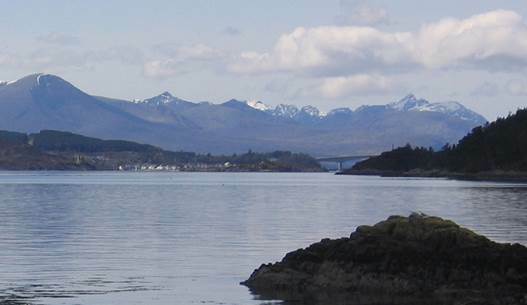 View from shore near Blythswood looking west over Lochalsh to Skye. 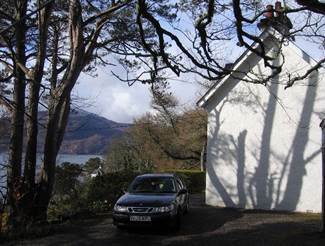 This private and secluded house on Lochalsh is one of the best settings from which to enjoy all these and at the same time it is easily accessible: 3 miles from Kyle railway station, 80 miles from Inverness, 4 hours from Glasgow and Edinburgh. Mountains rise from the sea to over 1000m, there are deserted sandy beaches, old woodlands and fertile sheltered valleys where tender plants thrive and waterfalls tumble among mossy rocks. Our house has its own private track and is surrounded by the National Trust for Scotland Woodland Garden at Glaick. The accommodation comprises 3 bedrooms - 2 double and 1 single; Lounge with double sofa-bed; Dining-room with wood/coal burning stove; Kitchen with electric cooker, fridge-freezer, microwave oven and automatic washing-machine; Bathroom and toilet. Heating is by night storage heaters and/or wood/coal burning stove. Hot water by night storage/normal immersion heater. The house has been recently restored and is furnished with fitted carpets, high quality beds, double glazing and most modern appliances. Blythswood - gable end and drive. Home - Do you want to see our other holiday house in Braemar?